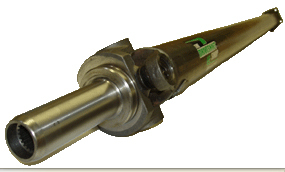 This is a steel 1-piece replacement shaft for the 240SX platform. This shaft is about 5lb less than the factory 2-piece and will give the car a faster throttle response due to the fact the hanger bearing is not moving up and down during acceleration. A less expensive alternative to our aluminum shaft, it has been suggested by a few of the drift cars that we sponsor the steel shaft breaks the tires loose quicker than the aluminum. This steel shaft will give you most of the benefits of the aluminum shaft, without the cost. Please Note: Whether or not the car was equipped with ABS from the factory will change the length of the driveshaft. Be sure to check vehicle before ordering. Comes with 1 year warranty.